Hi, everyone! 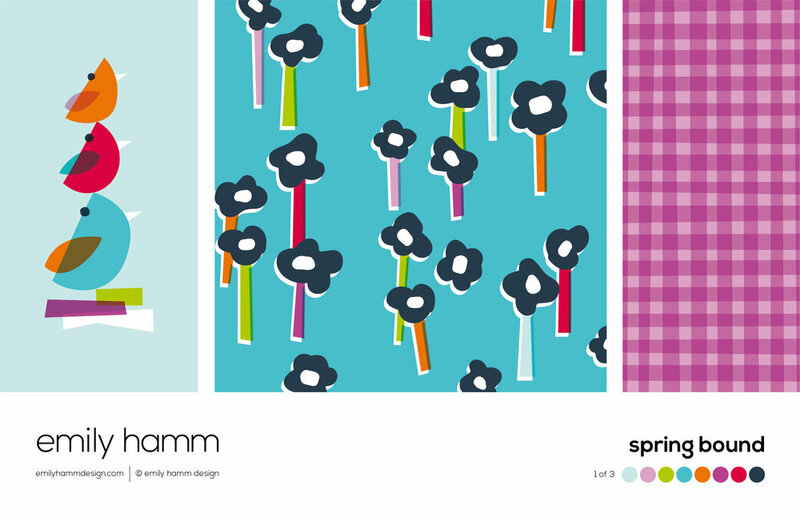 My name is Emily Hamm, a graphic designer & pattern designer out of Oklahoma. I spent about 10 years at an in-house design studio, where I designed patterns, products & packaging. Although I have lots of experience as an in-house designer, I am new to this side of the pattern world. Thanks to the support of my husband, a little over a year ago I began Emily Hamm Design, a graphic & pattern design studio. Currently I’ve been freelancing design while developing my personal pattern design style, taking classes, and designing lots of patterns. My hope is to begin freelancing/selling/licensing my pattern work soon. HAVE YOU ALWAYS WANTED TO BE SURFACE PATTERN DESIGNER/ILLUSTRATOR? I have always wanted to be in a creative field of some sort. Being unaware that pattern design was a career path, I chose graphic design instead. I love graphic design and still use those skills daily. As long as I can remember I’ve always been drawn to patterns! Recently, going through some art I did in grade school I found drawings & paintings of guess what? Patterns! I guess I really was a pattern designer before anything else. I work from my home, a cute little, hundred-year-old, farmhouse with a studio that’s just perfect for me. With a flexible schedule, I work 4-5 days a week, depending on my workload. Coffee in hand (I’m NOT a morning person), my day usually starts around 8:30, where I begin by checking my emails, social media and planning out the day. From there, I work on developing patterns or working on graphic design projects for clients. When it comes to design… keep things in perspective and don’t put too much pressure on yourself. If I can switch gears and work on another project I will do that. But sometimes, when I am really struggling it helps to take a break, go on a walk or do some market research. It also helps to step back, and look at the big picture of my goals for my designs. Being a graphic designer too, I am all about working within the design programs. Adobe Illustrator is my favorite program. HOW WOULD YOU DESCRIBE YOUR DESIGN PROCESS? 1st, I conceptualize: Research, look through books, write word lists that come to mind, & thumbnail/sketch. 2nd, I develop: I get on my computer, and start developing work from my sketches or straight from my head. 3rd, I refine: step away from it for a bit, come back and refine the designs, make major and minor changes until I am happy with the result. As far as apps go, I like Adobe Capture: an app that quickly vectorizes photos. A few of my favorite projects have been working on Christmas paper goods & fabric for Hobby Lobby. I would love to see my pattern designs carried by brands like West Elm, Target or Cloud 9 fabrics. I dream of projects such as fabric lines, paper goods and home goods. Graph Paper, Pantone Swatch book (color bridge), & my computer. All over really. Social media of course, design books, the beautiful variety of the flowers at the park, trendy packaging at a local boutique, or a vintage illustrated book at an antique store. I also gather inspiration from other creative fields such as furniture design, architecture, fashion or music. I hope people remember me as someone that inspired them to love others and live a full (and pattern filled) life. We have a great opportunity for our Rise Design and Shine community once again! Trend forecaster, consultant and Designer, Emily Kiddy has provided us with an insider look at some of the trends that will be included in her next Trend publication. What’s more, any designs you create for these trends can be submitted to be included in Emily’s industry shared Trend Report. If your work is featured, you will also receive a free PDF version of the full trend publication (for personal use). These reports are sold to retail companies with a focus on design for Baby, children and pre-teen age ranges. Many of the designers featured in these reports are approached by the companies using them to either license the designs they see or work on a commission or freelance basis to create something specific – win win! So if you are currently designing with kids in mind or want to start, this one’s for you! Simply pop your name and email address in the form below and you will get access to download the pdf. You are free to work on these trends as long as you wish but as this is a live call for submissions/brief, if you would like to submit your designs to Emily, you have until Midnight (GMT) Friday 22nd of September. *Please note that the trend inspiration boards and notes shared with you are NOT to be shared online, on social media or any other public forum. They are solely for your reference, to be used as design inspiration. Please confirm your email address (in your inbox) to receive access to the pdf download. Check spam/junk mail if you can't see it. We have a great opportunity for our Rise Design and Shine community. Trend forecaster, consultant and Designer, Emily Kiddy has provided us with an insider look at some of the trends that will be included in her next Trend publication. What’s more, any designs you create for these trends can be submitted to be included in Emily’s industry shared Trend Report. If your work is featured, you will also receive a PDF of the full trend publication (for personal use). Simply pop your name and email address in the form below and you will be emailed the trend insights for 5 key trends this Sunday. You are free to work on these trends as long as you wish but as this is a live call for submissions/brief, if you would like to submit your designs to Emily, you have until Midnight (GMT) Sunday 12th February.